How about a DC Friday for old time’s sake? 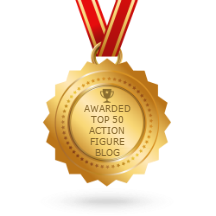 Once upon a time I could fuel DC Friday every week with a seemingly unending offering of figures from Mattel and DC Collectibles, not to mention there were statues galore! Well, DC Collectibles killed off their Icons line, Mattel just lost the license to Spin Master, and I’m trying to not buy as many statues these days, because I’m all out of room to display them. 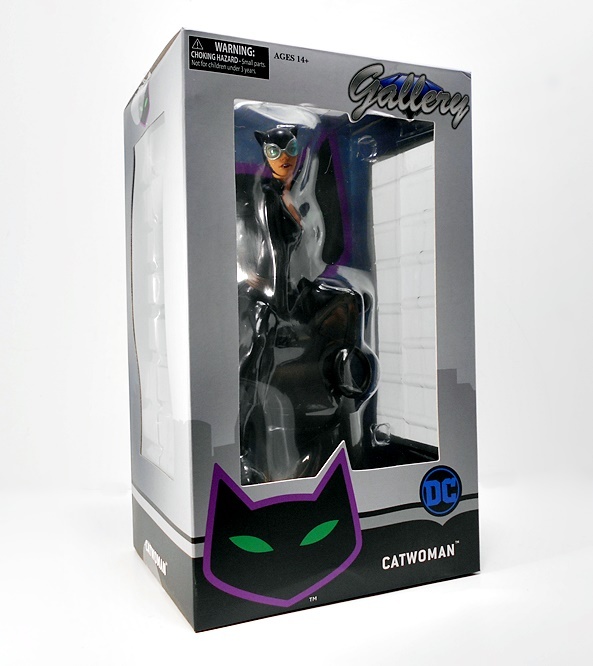 Nonetheless, Diamond Select’s DC and Marvel Gallery series continues to be tough to resist. And their new version of Catwoman was an impossible temptation! So let’s take a look at this feline temptress! 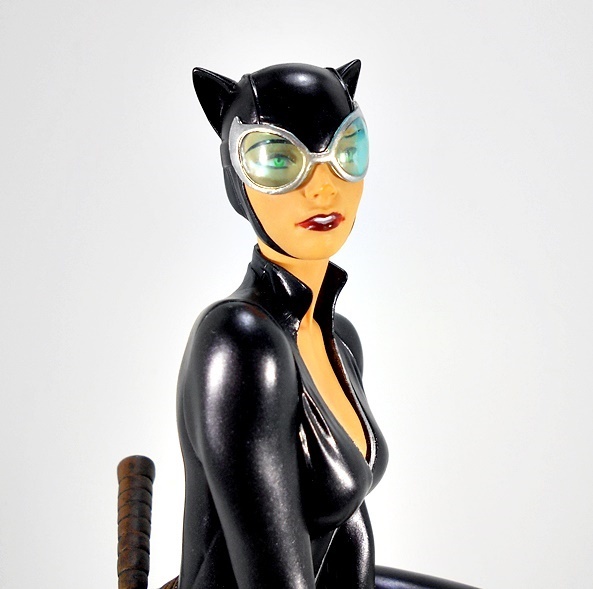 For the unacquainted, DST’s various Gallery series are a budget line of roughly 9-inch scale PVC statues that grew out of their old Femme Fatales series. They later branched out to DC Animated Series statues before ultimately embracing all of Marvel and DC. The statue comes in a box with windows on the front, sides, and top panels, which offer enough visibility that you could just about get away with displaying these in the package. That works for me, because I ran out of shelves long ago, and now I display most of these as a wall of the stacked boxes. 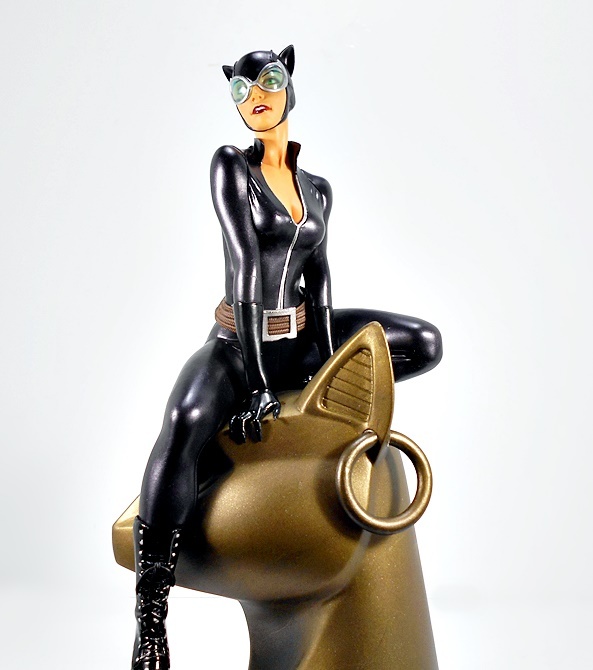 While the DC Gallery’s previous versions of Catwoman have been based on her animated appearances, this one is drawn from her more modern comic look. 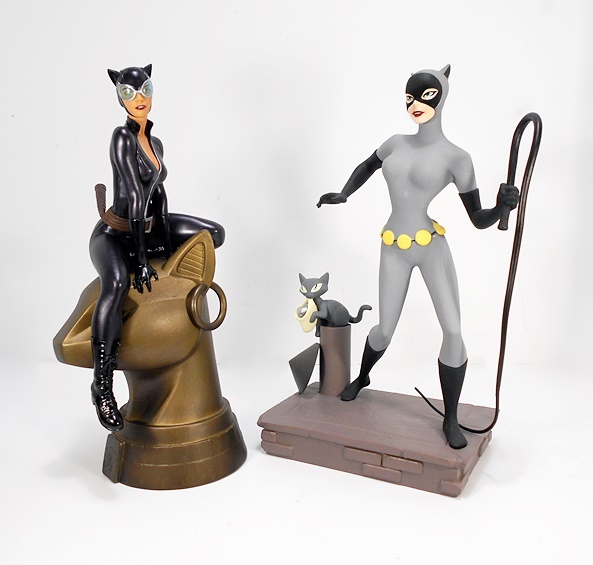 Of course, everything here is collector friendly, and Catwoman comes out of the box all assembled and ready for display! And this is a case where the composition and overall style had me mashing the pre-order button the moment I saw pictures in the solicitation. 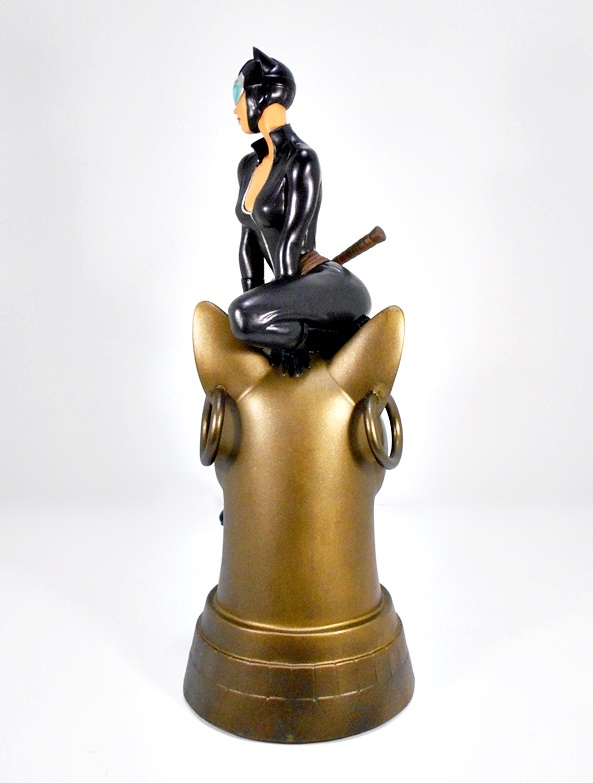 Sure, when it comes to Catwoman I’m an easy mark, but having her perched on the giant Egyptian-styled cat-head turned my head in a big way. 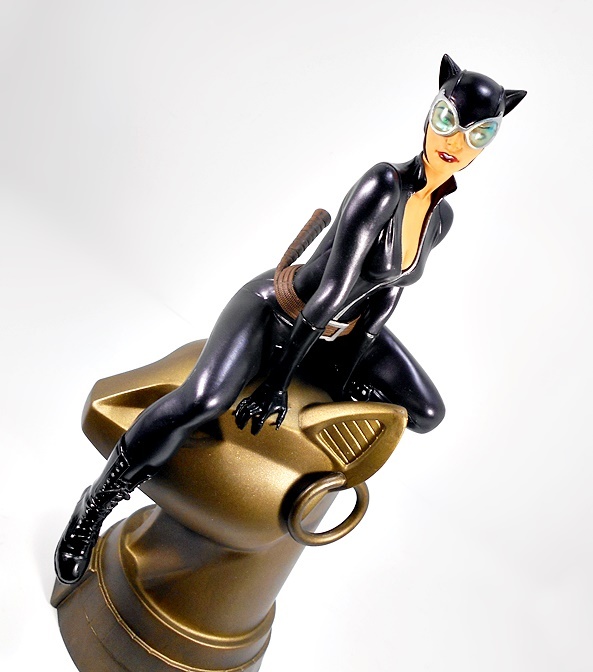 She sits on the top of the statue with one leg bent under her and the other dangling down, while leaning slightly forward on her hands, both clutching at the statue in a very cat-like manner. I’d like to imagine that she just crept her way into the skylight of the Egyptian Wing at the Gotham Museum of Antiquities, pounced down onto the head of this giant statue and is now sizing up the various lasers and security cameras that stand between her and whatever coveted bauble she happens to be after. There’s something to be said when the composition can send my mind to working up context for the figure and that’s exactly what happened here. 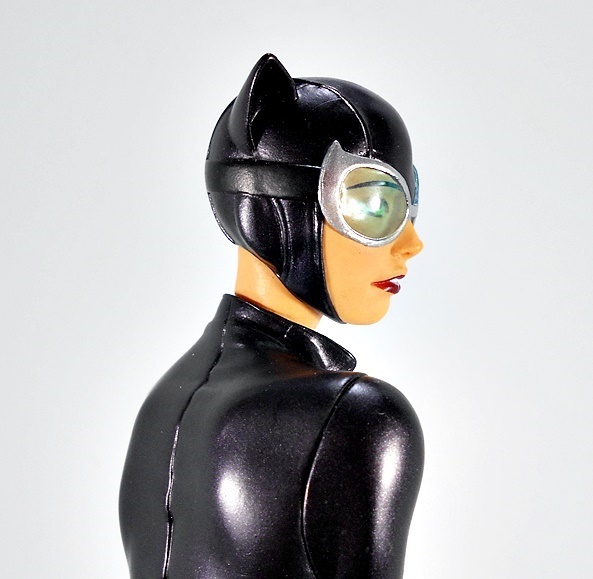 Despite being a fairly modern look, Catwoman’s costume gets by with a fairly low amount of detail, and that is in no way a slight against the sculpt. Her body suit relies on some neatly sculpted stitch lines and it’s smooth contours accentuate her curves and muscle tone in all the right places. The finish looks black, with just the right amount of gloss to make it look like leather, and under the right light it can give off a purple sheen. The front of the suit features a silver zipper, which is pulled down just enough to show off her kittens, and that low plunge is balanced out by a high collar. And while the suit itself is simple, that’s not to say there isn’t some great detail to be found. The boots in particular are wonderfully done, with sculpted laces running part of the way up and interlaced through the eyelets. 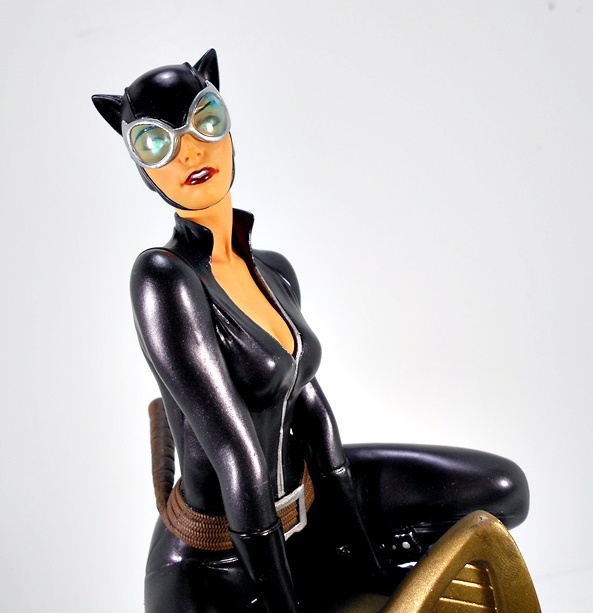 The excellent sculpt is finished off with a high gloss black to differentiate them from the rest of the suit, and the same finish is used on Catwoman’s gloves. Her brown whip, which doubles as her belt, is coiled around her and sculpted with a very fine braided pattern. It loops around her waist four times, held in place by a silver belt-buckle, and terminates with the segmented grip protruding from behind her right hip. And that brings us to the portrait, and DST did a fine job on it! I love the way the mouth is sculpted with the lips slightly apart to show off her pearly whites, her nose is perfect, and while I don’t really associate this likeness with any one artist, I still think she looks great. The cowl is sculpted with the same stitch lines we see in her suit, and the paint lines between the cowl and her skin are clean and sharp, even around the chin strap. One of the things that particularly impresses me here are the lenses in her goggles. They’re remarkably clear for a piece in this price range, showing off her green eyes. Hell I think the lenses here look every bit as good as the ones on DC Collectibles’ second Cover Girl Catwoman statues, which retailed at more than twice the price. And that brings us to the base, which not only compliments the figure beautifully, but really elevates the whole statue. The Egyptian cat head features a large loop earring in each ear, some geometric patterns around the base, and a Egyptian eye motif on the collar. It’s all sprayed in a gold finish, which has just the right amount of sheen to it. It’s quite simply marvelous! With over two dozen of these Gallery statues in my collection, I usually only have the space to have a handful on display at any one time. So it’s quite the compliment to say that this one is going to be immediately taking up one of those spaces, and bumping someone back into their box. I just haven’t decided which one yet. This is a piece that I was super excited to get from the moment it was revealed, and now that it’s in hand, I’m happy to say she does not disappoint. Toss in the fact that she was only $44 and it’s hard not to love and appreciate what DST has been doing with this line. Every time I think I’m out, they release a beauty like this one to pull me back in! Am I weird to think the BtAS Catwoman is the best Catwoman design? It’s a little weird, isn’t it? I just think the sleek, simple design works so well for the character. The modern look as presented by this status is actually my least favorite. I dunno, it just screams displayed to me. I like this look a lot for her, but I sure don’t think you’re weird for digging the BAS look. I love it as well. Thankyousomuch autocorrect. How did it decide “cosplayer” should be changed to “displayed”?